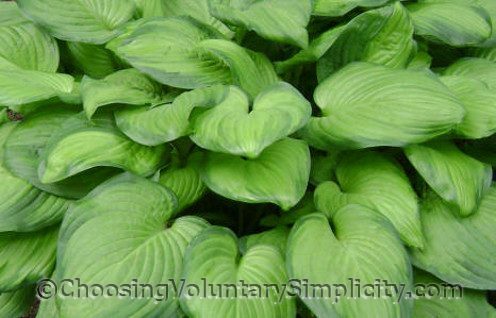 Hosta ‘Guacamole’ was named the 2002 Hosta of the Year, and it definitely is near the top of the list of hostas with the most fragrant flowers. Guacamole produces large, trumpet-shaped, pale lavender flowers and leaves with chartreuse centers and darker green margins. I have five Guacamoles growing in various areas of different gardens, and the ones growing in sunnier locations definitely have more vivid coloration. However, even for those Guacamoles growing in the shadier gardens, the chartreuse centers get brighter as the season progresses. My Guacamoles blossom every year but have never produced seeds, which is typical for this hosta. Guacamole is a sport of Fragrant Bouquet, and it has produced several sports itself, including Fried Bananas with golden foliage and Fried Green Tomatoes with medium to dark green foliage. This is one of my favorite hostas. I like the way it looks but I especially like the scent of the flowers. It reminds me of trailing arbutus, a wildflower that I used to pick when I was a child. This *is* a nice hosta but the one I have is losing some of it’s darker green coloration. I think it may be where it is growing because I had 2 growing in the same place and I moved 1. The one I moved is the one that is losing the darker green. After reading here I am going to move it back to see if the color comes back. I love hostas. My mother used to have some and I didn’t like them at all but I think I have caught the hosta bug because they are some of my favorite plants now. 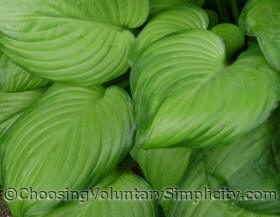 I belong to a swap group where we swap hostas two or three times a year. I still can’t believe some of the wonderful hostas people have given me through this swap.